This is THE official uniform, but in many pieces of BSA literature it may be referred to as the FIELD uniform, or commonly, the "Class A" (a military term the BSA prefers NOT to use as the BSA does not wish to be perceived as a paramilitary organization). * Technically, hats and neckerchiefs (and how they are worn) are optional in the BSA Uniform Guide. If the wearing of either is adopted by a troop, they are then considered official components of the uniform. A neckerchief bearing our logo is to be worn UNDER the collar with the top button of the shirt unbuttoned. ** The Merit Badge Sash, worn over the right shoulder, is impractical for most scouting-related activities. Therefore it is only worn at ceremonial events or select meetings, such as a Court of Honor. It is not always practical to wear the Field Uniform shirt every minute a Scout is involved in a scouting-related activity. The BSA offers a variety of polo-type shirts and tee shirts imprinted with BSA logos. It is customary practice that when a troop (as a whole) agrees on a standard shirt, they will opt to wear it INSTEAD of the BSA shirt. In many items of BSA literature this will be referred to as an ACTIVITY uniform, or sticking with military nomenclature, "Class B". 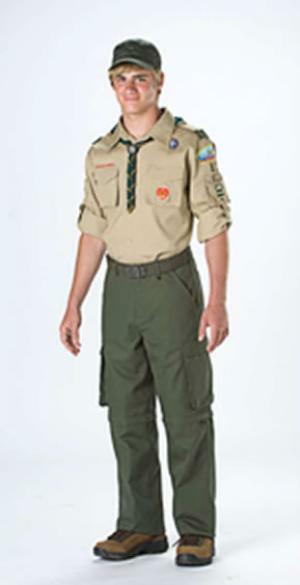 Uniform pieces can be purchased online at www.scoutstuff.org, at the Great Rivers Council office in Columbia, or the Ozark Trails Council office in Springfield. A limited selection of basic uniform items is also available at Bill's Farm & Home in Lebanon.